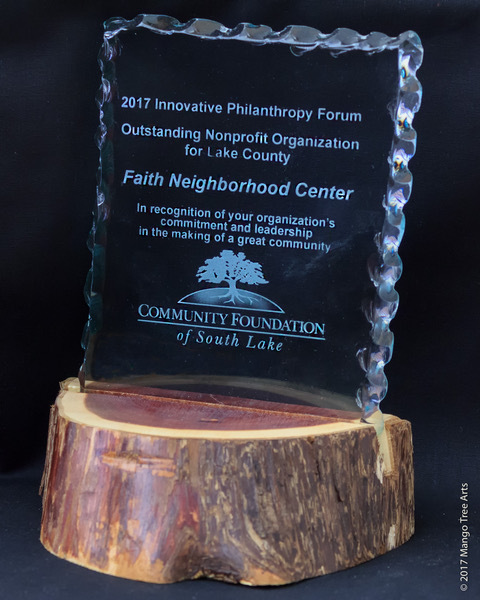 The FAITH Neighborhood Center was founded in 1972 and has been in continuous operation since opening. The Center has grown until now we have over 100 active volunteers. Our dedicated volunteers allow us to keep the costs of running the Center with a small part-time staff as low as possible. We provide support to low income families and individuals in South Lake County– Mascotte, Groveland, Clermont, Minneola, Montverde and points in between and south to the county line. • Medical support in conjunction with the South Lake Community Health Center. • Assistance in applying for food stamps, Medicaid and Emergency Assistance. Aimee and her husband, Christian, have one daughter, Mackenzie, who has been a part of FNC all this time. Aimee formerly worked for Disney but now manages a vacation rental and Christian works at Universal Studios. When asked what her fondest memories are of FNC, she replied, “Seeing and working with the kids.” And she is willing to do whatever is needed when she volunteers. Thank you, Aimee. Watch for more information on our 2019 Annual Golf Tournament scheduled for Friday, September 13, 2019 with tee off starting at 8:30 am. There are many ways to donate to the center: Donate Money, Food, or your time. Or become a Partner of the Center. Click on the Ways to Help menu at the top of each page to learn how. Donating to the Center is easy. Donate by using your favorite credit card by clicking the DONATE MONEY NOW button below or just send a check to the Center. 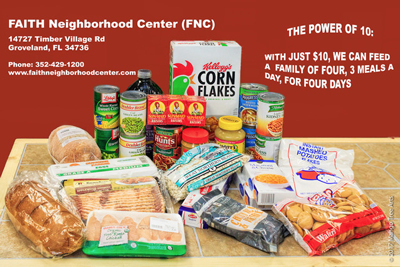 Donate food through your favorite participating Church or just bring your food to the Center side door. A good alternative is to donate money for food, providing a 10-1 payback. Donate your time by volunteering to help in many different ways. Call the Center for information. © 2019 Faith Neighborhood Center, 14727 Timber Village Road, Groveland, FL 34753. The Center is a non profit 501(C) organization.